CPT codes are in place, but breast imagers are adapting to payer and workflow challenges. Create new billing codes for digital breast tomosynthesis (DBT) and insurers will pay. Maybe. That’s the situation breast imagers are facing since three new billing codes and reimbursement rate values were created for DBT, also referred to as 3D mammography, effective January 2015. The codes address both screening and diagnostic studies. While The Centers for Medicare & Medicaid Services (CMS) found sufficient evidence of the technology’s effectiveness, many private insurance companies continue to find the modality investigational and thus are not reimbursing. Despite sporadic instances of reimbursement, breast imagers are still performing DBT. In some instances, patients are asking for this 3D imaging modality, particularly those with risk factors such as dense breast tissue, or those who have a history of breast cancer. Other women, however, are deciding against DBT, due to its cost. Since FDA approval in 2011 of Hologic’s Selenia Dimensions system, the United States has seen two more 3D mammography options enter the market. GE Healthcare’s breast tomosynthesis solution, called SenoClaire, received FDA approval in 2014. Siemens Healthcare’s offering, approved this year for use in the United States, is a breast tomosynthesis add-on option for the company’s MAMMOMAT Inspiration digital mammography platform. Ochsner adopted Hologic’s 3D mammography system at three of its facilities in 2013. Smetherman says they use DBT with both screening and diagnostic mammograms. In some cases, patients have both planar mammography and DBT done during the same visit, while other times patients are recalled once something is found in the 2D mammogram or if there is a palpable finding. They also use DBT with image-guided ultrasound for biopsies. According to the ACR, where Smetherman serves as cochair of the organization’s breast imaging economics committee, DBT is not considered an experimental modality for breast cancer screening or diagnosis, she says. Study findings support use of DBT as a supplement to mammography, showing that the 3D modality is useful in increasing the detection of breast cancer, particularly finding small, invasive cancers, as well as in decreasing recalls. “Digital breast tomosynthesis improves sensitivity and specificity,” Smetherman says. However, there still seems to be a desire for more evidence on the part of private insurers. At the request of professional organizations such as the American Roentgen Ray Society, RSNA, and the ACR, the American Medical Association’s CPT Editorial Panel created three new codes to describe the physician work and practice expense associated with screening and diagnostic DBT. However, CMS recommends that only one code (77063, screening digital breast tomosynthesis, bilateral) be used as this time, in conjunction with the digital screening mammography code. This recommendation is based on an FDA requirement that a 2D mammogram accompany DBT when used for screening purposes. “Despite the fact that we provided significant evidence for CPT codes with CMS, private insurers still believe that DBT is investigational,” Smetherman says. Word regarding the benefits of advanced technology such as 3D mammography has spread throughout the patient community, she says. While women may ask to have this type of screening, along with their 2D mammogram, that request will come with a cost. One of those markets is the patient population of Yale’s Smilow Cancer Hospital in New Haven, Connecticut, where Geisel practices. She says they converted to Hologic’s tomosynthesis system for all their locations, with the exception of a mobile unit. During the time prior to CMS reimbursement, Smilow was not charging for DBT, Geisel says. Now, however, with billing codes and reimbursement in place, patients are seeing the bills but not reimbursement. As a result, she has already seen a slight reduction in the number of patients deciding to have the 3D screening mammogram. For patients in one upstate New York community, insurance companies are still not covering DBT. Stamatia Destounis, MD, FACR, attending radiologist at Elizabeth Wende Breast Care in Rochester, New York, says that establishing codes is “a step in the right direction.” However, she’s not seeing much change when it comes to reimbursement. Destounis says that a lack of reimbursement hasn’t stopped her practice from using DBT, particularly in cases of women with dense breasts and other high risk factors for breast cancer, including patients with personal history of breast cancer. In addition, she says DBT can be helpful in viewing a lumpectomy scar and areas of postsurgical change that may be challenging with standard full-field digital mammography. Elizabeth Wende Breast Care began using DBT upon FDA approval of Hologic’s Dimensions 3D system in 2011, having served as one of several clinical research sites for the device. Through increased clinical research and word-of-mouth among the patient population, DBT requests increased to the point where the facility now utilizes seven tomosynthesis machines, Destounis says. “Tomosynthesis is used in both screening and diagnostic situations,” she says, “and is available for all patients. Some patients even ask for DBT. Also seeing good results with DBT is William Poller, MD, director of the division of breast imaging in the Allegheny Health Network. Allegheny was the first facility in the United States to adopt GE Healthcare’s SenoClaire system, installing it in two locations within this Pittsburgh health care network. Poller’s goal is to have the technology at all facilities within the Allegheny system, due to the positive results he’s had with patients. He reports seeing lesions with 3D mammograms that don’t appear in the 2D mammogram. The caveat of offering DBT to all patients, however, is that Allegheny also gives patients a card stating that while this 3D technology is beneficial in the early detection of breast cancer, the patient may be responsible for the cost. Poller says that a lack of reimbursement could be one of the reasons why he has seen a decrease in tomosynthesis volume. Smetherman notes that there was also a “groundswell” of research presented at the annual RSNA meeting in 2014, “confirming what we already know about the benefits of 3D mammography. Geisel also notes that with the emergence of tomosynthesis devices from more than one manufacturer, insurance companies may also want to see studies that include data from all the offerings. Destounis says that part of the hesitance toward reimbursement could be due to a lack of standardization among vendors and tomosynthesis systems. Regardless of the modality, however, there’s always some variability among machines, she adds. “As several vendors have become FDA approved, there will have to be standardization of the technology and the imaging options per vendor,” she says. Next steps to more widespread reimbursement could also include education, Smetherman says. Professional organizations, including the ACR, are working with practitioners and payers, providing resources for physicians to use in conversations with insurance companies to help overcome resistance to reimbursement. The ACR “toolkit” includes a template letter to insurers requesting coverage of DBT, the ACR’s current position statement on DBT, a frequently asked questions document, coding guidance, and a link to an ACR-sponsored DBT webinar held in January. As usage and issues on the billing side evolve, adoption rates can also hinge on developments discovered during the course of using DBT on a more regular basis. Destounis says that with the nature of DBT, her practice has found that workflow is slower by “about 50%,” as there are “lots of images” to read, particularly given that most cases involve looking at both 2D and 3D images. Conversely, Geisel notes a time savings in doing 2D and 3D at the initial screening. Changing their practice to include tomosynthesis has actually improved part of their workflow. Another issue involves data storage, Destounis says. As with any new imaging technology, there’s an evolution between FDA approval and coverage. Only four years have passed since the first FDA approval of DBT in the United States. 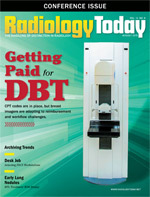 Imagers make a comparison between this and the adoption of other new imaging technology, such as breast MRI and computer-aided detection, when considering how much more time it might take before insurers begin to offer more widespread reimbursement for DBT. Poller compares it to the early days of digital mammography, saying that when that was first introduced to the US market there was no reimbursement. Like other breast imaging modalities, tomosynthesis use will evolve as users learn more about best practices and the reimbursement process matures. — Kathy Hardy is a freelance writer based in Phoenixville, Pennsylvania. She writes primarily about women’s imaging for Radiology Today.